OCTOBER PRIZE: WATERMELON WELCOME MAT - What About Watermelon? One thing I remember most from my childhood is the many weekends spent away at Grandma’s house. As most kids my age moaned and groaned about having to visit their relatives, I found much joy in it. Grandma always had the best candy and cookies, and my Grandpa always seemed to find quarters behind my ear. But my favorite thing about Grandma’s house — which, I admit, sounds kind of silly — were the decorative welcome mats she would lay on the front porch. Every month, Grandma would swap the mat with another, which usually had “punny” jokes and short, inspirational quotes. She had a bit of funny bone, which may explain where I get my humor. This month’s prize is inspired by my grandma’s fun-loving, welcoming attitude and everyone out there just like her. 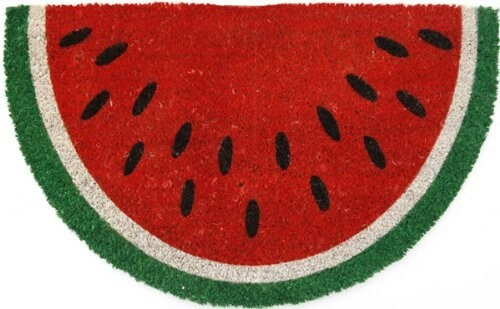 The watermelon doormat you see above ($40 online) will look perfect on any watermelon-lover’s doorstep. I know this because I bought one for myself last year. I loved it so much that I actually stepped over it for the first six months so I wouldn’t tarnish it with my dirty shoes. Leave a comment on this post, and I’ll choose one at random to win one of these watermelon welcome mats — and you can find out for yourself if you’d be as protective of your mat as I was! WEEK THREE WATERMELON PRIZE: WATERMELON EARRINGS! NATIONAL WATERMELON MONTH PRIZE #2: WHERE WOULD YOU PUT THIS YARD DECORATION?